What is ‘farmer cheese’ you may well ask, as did I. Imen McDonnell the author of ‘The Farmette Cookbook’ explains it as a simple cheese made with just raw milk and white vinegar. Have no fear, I did not dip my toe in the whey of cheese-making and asked instead for a suitable substitute and was told either a cottage cheese or a soft goat’s cheese and I opted for the latter. Ardsallagh is one of my favourite Irish cheeses and in advance of making this recipe I was lavishing it on toasted sesame bagels embellished with red onion relish. Divine. 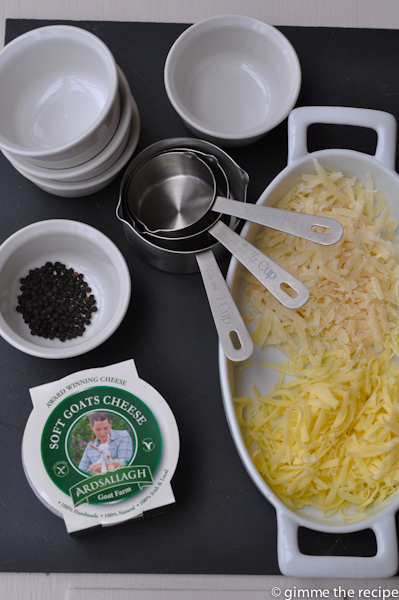 The other cheeses pictured grated above are gruyere and parmesan. Also pictured is a set of measuring cups. I picked these up eons ago because I liked how they look but most of my baking etc. is done in grams or ounces so I usually use a scales. Today I pulled out the cups and used both and found measuring flour by the scoopful is much faster than having to weigh it out. Imen McDonnell is an American living in Ireland and has just launched her cookbook ‘The Farmette Cookbook’ on both sides of the Atlantic hence my use of cups though they are not a necessity as Imen gives metric measurements too. I hope you are as impressed as I am by my beautifully risen and golden souffles (just ignore the tad overdone one bottom-right please, still tasted delicious). Sublime. Knowing that oven heat is all important in souffle making I made sure my oven was pre-heating in advance of starting to cook. Milk and cream was infused with carrot, onion, herbs and peppercorns and allowed to cool. A roux was made and coaxed into a silken sauce with the infused creamy milk, then joined by the grated and crumbled cheeses, egg yolks and finally whisked egg whites. My mixture filled 9 standard kitchen ramekins plus 2 slightly larger ones. I made these on a leisurely Sunday morning when the eight of us were all around to enjoy them served with crispy bacon and golden buttery mushrooms. Imen’s book is breathtakingly beautiful. When you peruse it first you might think it’s one for the coffee table, starting off with a chapter on Traditional Dairy Skills not only informing you on dairy products such as buttermilk, various cheeses, butter, yoghurt and ice-cream etc. but also teaching you how to make them if you will. But as you move onwards the chapter ‘In the Bread Box’ presents you with a variety of breads, scones and baked goods with images that have you declaring ‘I’m going to try that.’ Onwards through the potato patch into the ‘Orchard’, a chapter then ‘From the Sea’ followed by a foray into foraging if you’re up for gathering wild garlic, nettles perhaps, lavender maybe, wild hazlenuts and crab apples etc. For now I will mostly be an armchair forager as that much wilderness is not outside my door but I usually do get to raid the hedgerows in West Cork towards the end of the summer and we have been known to make jams and pies from foraged fruits. Moving from armchair onwards to a chapter on ‘Sweet and Savoury Pies and Tarts’ with recipes for the various pie crusts and some amazing looking pies there’s plenty here to please. 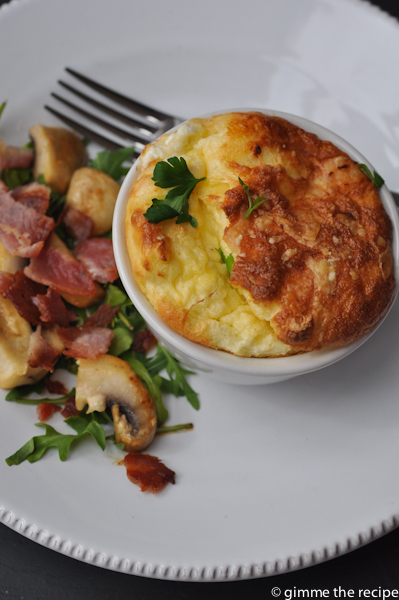 Country Suppers is where the ‘Irish Farmer Cheese Souffle’ is nestled though we had ours for breakfast. Imen’s photography is stunning (see the image at the end of this post). 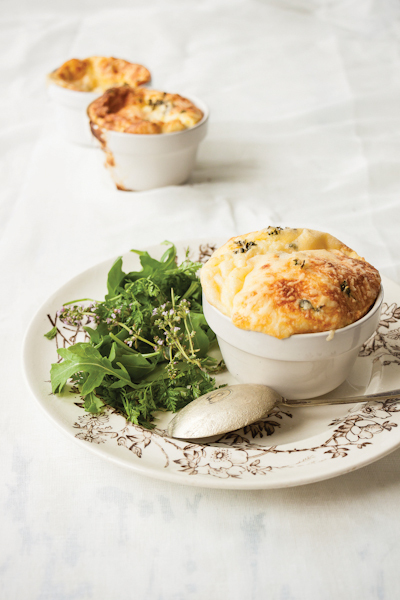 Here is the recipe for IRISH FARMER CHEESE SOUFFLÉ from ‘The Farmette Cookbook’ by Imen McDonnell. Preheat the oven to 450°F (230°C). 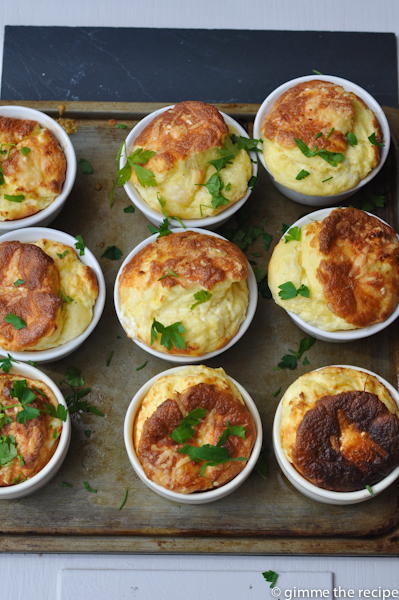 Brush the bottom and sides of six 3-inch-deep ramekins (or six soup bowls) with melted butter; set aside. Pour the cream and milk into a saucepan, add the carrot, onion, peppercorns, and fresh herbs. Bring slowly to a boil over low heat, then remove from the heat and set aside to infuse for 10 minutes. Strain, discarding the flavorings. Melt the butter, stir in the flour, and cook for 1 or 2 minutes. Whisk in the strained cream and milk, bring to a boil, and whisk until the sauce thickens. Remove from the heat and cool slightly. Add the egg yolks, farmer cheese, Gruyère cheese, and most of the Parmesan or Coolea cheese (reserving some for the topping). Season with salt, peppers, and nutmeg. Taste and correct the seasoning if needed. Whisk the egg whites until stiff peaks form, and fold them gently into the mixture to make a loose consistency. Spoon into the prepared dishes, scatter the lemon thyme leaves on top, and sprinkle with the reserved Parmesan or Coolea cheese. Bake for 12 to 15 minutes (9 to 11 minutes for the individual soufflés), or until the sides and top are nicely puffed up and golden—the center should still be creamy. Garnish with lemon thyme leaves and flowers, and serve immediately. Image and Recipe were furnished to me by a PR company for Bord Bia however the book review was unsolicited and book I used is my own copy of ‘The Farmette Cookbook.’ I was not asked to review this book. I only write about and promote what I LOVE!!! Available to buy online & in good bookstores! Check out what I'm up to on Instagram!